The show goes in a direction I think all adult fans probably expected, but my 6 year old was very surprised. We were both pretty upset about it. Let me just say when Kanan died in the previous episode, I was amazed how moved I was by the death of this cartoon character. I did not know I had become so invested in these characters. I actually owe Metafilter for watching this show in the first place. I'm a Star Trek, not Star Wars guy, but so many people were so enthusiastic about this series it made me start watching. Thank you for posting, French Fry! I enjoyed, but didn't love this episode and the one that followed, "Dume." 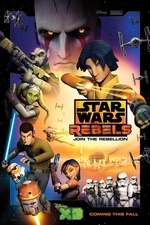 It took a second viewing before I really appreciated Kanan's death on a emotional level, but not until Monday's episodes, "Wolves and a Door" and "World Between Worlds," did I finally feel I could accept Kanan's death as something that happened [for spoilers sake, I won't go into the what/why]. Part that problem came from the purposefully hidden information that lead up to it which began in "Rebel Assault" when Kanan has that off screen conversation with the Loth-wolves. We don't know what was said, just that Kanan uncharacteristically decided not to go after Hera when she didn't appear with Mort (or whatever his name is). The way "Jedi Night" transposed Kanan basically preparing to die while everyone is prepared for the mission was also kind of weird, perhaps based on the music that was chosen. It didn't feel solemn enough for what was transpiring for Kanan on screen. As a result, when we did lose Kanan, I just didn't have closure in that sense, I felt that there was more to Kanan just being incinerated. It was a tad frustrating. I do feel like there is just a PILE of dave feloni headcannon left over from clone wars that he REALLY wants to wedge into the back of this. Next week is the series finale and I don't feel like the board is even set for the final conflict. Who are the players? what they are physically and philosophically up against? Like if every rebel ever shows up and defeats the empire at Lothal, that conflicts with Rogue One and the opening crawl of Star Wars. Will Ezra sacrifice himself making some kind of force portal for everyone to once again escape? Does the battle of Scarif interrupt events? Is Thrawn the ultimate bad guy or is Vader or Palpatine gonna show up again? I feel like it's gonna be a busy 90 minutes.